Remembering and reconstructing the past inevitably involves forgetting—and nowhere more so than in the complex relationship between the United States and Japan since the end of World War II. In this provocative and probing series of essays, John W. Dower—one of our leading historians of postwar Japan and author of the Pulitzer Prize–winning Embracing Defeat—explores the uses and abuses to which this history has been subjected and, with deliberation and insight, affirms the urgent need for scholars to ask the questions that are not being asked. Taking as a starting point the work of E.H. Norman, the unjustly neglected historian of prewar Japan, Ways of Forgetting, Ways of Remembering sets out both to challenge historiographical orthodoxy and reveal the configurations of power inherent in scholarly and popular discourse in Japan and America. Dower’s fascination with capturing popular experience leads to sources as far ranging as textiles adorned with wartime propaganda and the satirical cartoon panels that decorate traditional karuta playing cards. Dower, who is rightly known as one of the most perceptive critics of American foreign policy, also offers a blistering critique of the U.S. occupation of Iraq and the misuse of postwar Japan as an example of success. 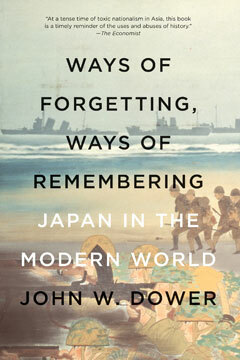 Ways of Forgetting, Ways of Remembering is a profound look at American and Japanese perceptions—past and present—of key moments in their shared history. An incisive investigation of the problems of public history and its role in a modern democracy, these essays are essential reading for anyone interested in postwar U.S.-Japan relations, as well as the broader discipline of history.